Hibiscus tea is equally delicious hot or cold. The dried flowers can be used in numerous non-drink recipes. Photo by Irina Magrelo | Dreamstime. 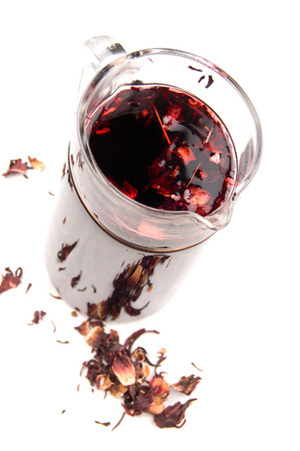 WHAT IT IS: An herbal tea made from dried hibiscus flowers. WHY IT’S DIFFERENT: Known in the industry as a “superflower,” hibiscus is one of the planet’s best sources of vitamin C and other powerful antioxidants. 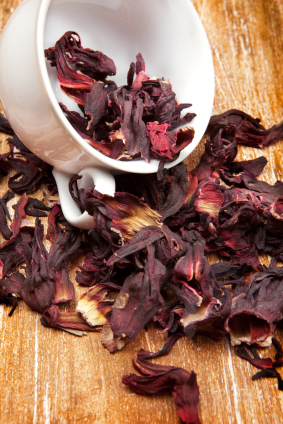 WHY WE LOVE IT: Hibiscus has a tartness like cranberries (and it tastes very similar). Hot or cold it’s refreshing; but on a hot day, a glass of iced hibiscus ea is heavenly. WHERE TO BUY IT: Tea bags can be found at many regular food and health food retailers. Bulk dried flowers can be found at Latin and Caribbean markets and online. See the links at the right for online purchase of our favorite hibiscus tea bags, from The Republic Of Tea. Find reviews of more of our favorite teas. Recipe Of The Week: Maple Bacon Muffins. What could be better with weekend brunch? Yes, hibiscus makes terrific drinks. People who enjoy cranberry juice should be especially attracted to it. If you like things tangy, don’t add any sugar. Or, add sugar for a tangy-and-sweet combination. Point Of Order: While we refer to “dried hibiscus flowers,” they are not the petals but the calcyes (the plural of calyx), the “fringe” between the petals and the stem. TIP: Use the tea to make hibiscus ice cubes. This will prevent your cold, refreshing hibiscus drinks from being diluted by regular ice. TIP: Don’t throw away the brewed flowers. Some people find them tasty. Think of them as poached or stewed fruit, and add sugar to taste. TIP: Dry hibiscus flowers can be used in fruit salads and other recipes. See ideas below. With sprigs of crushed fresh mint and/or a fresh lime wedge. In Mexico, the drink is known as agua de Jamaica (pronounced hah-MIKE-uh in Spanish). Blended with iced black or green tea. Mixed with lime juice: a hibiscus rickey. To make an alcoholic rickey, add an ounce of bourbon, gin or rye whiskey to a collins glass, add the tea and top off with soda water or sparkling mineral water. Bended with rum or wine. And of course, you can enjoy hibiscus tea hot: It is equally delicious. Make the tea into granita, sorbet and popsicles; try this easy recipe for shaved ice, substituting hibiscus tea for the jasmine tea. Add the flowers, dry or “stewed,” to fruit salads. Make chutney, jam, jelly or marmalade. The flowers are 3.19% pectin, so no additional pectin is needed. Make a syrup for cocktails and dessert (or you can buy it). It’s delicious in Champagne and Martinis. The tender young leaves and shoots of the roselle plant are also edible. They can be eaten raw in salads or cooked as greens. Popular all over the world: Introduce it to your friends and family. Lowers high blood pressure, high cholesterol and triglycerides. Is one of the most powerful sources of the antioxidant vitamin C.
Can contribute to weight loss (it contains an enzyme inhibitor that blocks the action of amylase, the enzyme that breaks down carbohydrates into their absorbable forms). Calms minor digestive orders as well as symptoms of the common cold. It also lowers fever. An extremely high concentration of flavonoids, powerful antioxidants, assist the body in neutralizing free radicals (which among other things are responsible for aging and cancer). Dried hibiscus flowers (the calyx). Photo by Blue Clue | IST. Check with your healthcare provider before consuming more than three cups a day. People who already have low blood pressure—as well as those taking certain serious medications—may need to forgo large quantities. Otherwise, get out your tea kettle and start to enjoy this flavorful, healthful ruby-red gift of nature.